Leaving her soon-to-be-destitute family in Ireland, Clara Kelley boards a ship for America. Knowing their survival depends on her ability to find a job in America scares her and drives her to do all she can to help her father keep what is left of their dwindling farm. Boarding the ship with her meager possessions, Clara endures a rough voyage, landing in her new country a little worse for wear and, like her fellow passengers, eager to set foot on dry land. Always ready for a fight, quick with her words and emotions, the travel conditions and loneliness leave her drained. Once the boat finally docks, her apprehension and anxiety get the best of her, and she trickles through immigration with her fellow passengers in a daze, hoping officials find no reason to hold her. When she is finally released, she stumbles into the street with hundreds of others, and the sound of her name being called pulls her out of her stupor. "Benedict’s writing is magical. This is one of those books that you plunge into and regret finding that you’ve come to the last page." Clara encounters a well-dressed man, clearly a servant, calling her name. Knowing it’s probably another Clara Kelley, but letting her curiosity get the better of her, she answers to her name. The Clara Kelley he’s looking for isn’t her, but she is in need of a ride to Pittsburgh and decides that this small lie --- a lie she tells herself she can rectify once she’s safely in Pittsburgh --- can be explained away easily. In Pittsburgh, brushing away the lie becomes more difficult once a job is offered to Clara. Her quick wit got her far, but she knows little about being a lady’s maid, and has doubts about being able to provide services to a wealthy family such as the Carnegies. Trepidation sets in, but Clara steels her nerves and decides that the money to help her family is more important than a small lie, and she sets out to make herself indispensable to Mrs. Carnegie. What she doesn’t expect is to find herself wanting to be indispensable to the intriguing Andrew Carnegie as well. I read Marie Benedict’s debut novel, THE OTHER EINSTEIN, last year and adored it. 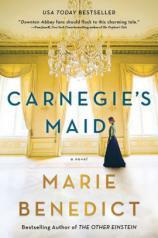 CARNEGIE’S MAID is every bit as wonderful, even more so in fact. Clara Kelley is just a brilliant character --- smart and full of heart --- and you immediately fall for her, much like Andrew Carnegie himself. Benedict’s writing is magical. This is one of those books that you plunge into and regret finding that you’ve come to the last page. If you have the chance to pick up CARNEGIE’S MAID, please do it. You will not be disappointed.